December 18, 2013. I’ve never been more grateful for a window seat on an airplane than I was descending into Kathmandu, Nepal. The Himalayas, green and lush, came thundering into view in all their enormity and terrifying beauty. In the distance, snowcaps could be seen, whose peaks stuck their noses through the white fluff of the day’s few clouds. I loved Nepal immediately. This would be my twelfth and final program in as many weeks on the field, my first long stretch as a member of the Coaches Across Continents team. I could not have asked for a better way to close out 2013 – a better location, a better partner organization, a better group of people to work with. The week was incredible for many reasons. First and foremost (for me at least)… we were back to football! Thank goodness. After two weeks of netball programs in India (and 5 weeks total in a country where Cricket reigns supreme), it was a relief to be back in a place where I could sport my Iniesta Barcelona jersey and people actually knew who he was, not to mention what team he plays for. We were back to a place where the people speak the universal language of football, and it was oh so sweet. Myself (Nora Dooley), along with fellow staff member Sophie Legros, and volunteer Sarah Brown, arrived in Kathmandu, quite honestly, rather exhausted. 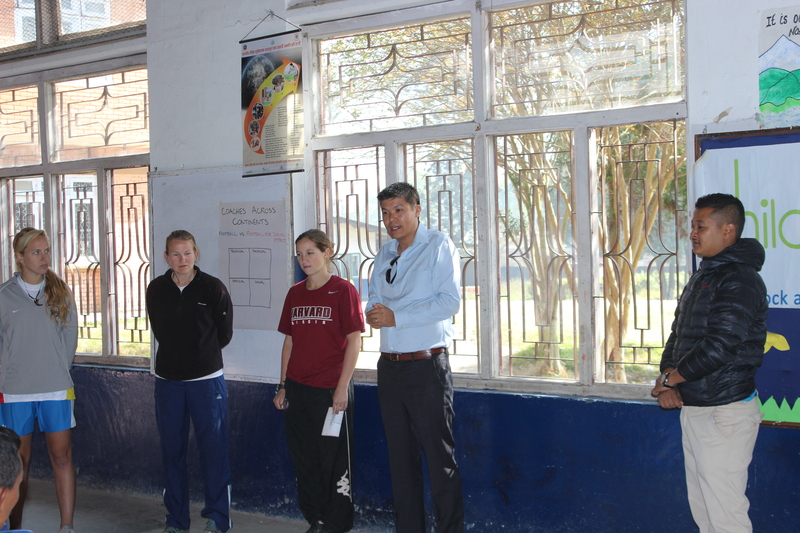 One day working with Childreach Nepal, however, and we were instantly energized. It is organizations like this one that make our job not only easy and fun, but also fulfilling, refreshing, and inspiring. 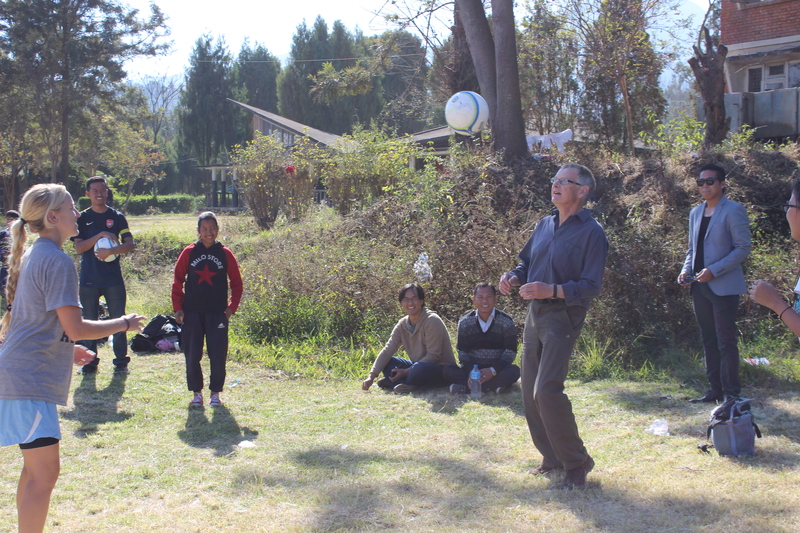 Childreach is an international organization based in the UK with sites across the globe, but Childreach Nepal is special. After a week of training and various meetings with the staff here in Kathmandu, our team has begun to realize the potential of this power partnership. Tshering Lama, Childreach Nepal’s Country Director, speaks our language fluently (we’re multilingual), the language of social impact. He understands the need to rethink the way the world sees education, especially the education of children. Our team is beyond excited about the opportunity to work and grow together with this organization, as our first week with them proved that this can and will be a formidable pairing. One last note regarding education… I am only 23 years old and I have now been to 21 countries, living in 3 different ones for various lengths of time – I am lucky. Traveling teaches you infinite lessons, and one of my all time favorite quotes (aside from the one above) is Mark Twain’s “I have never let my schooling interfere with my education”. But it was not until CAC that I learned that schooling can also be different. Schooling can take place outside the classroom, away from the pens and paper, sans exams. Schooling does not have to be dictated by tradition. 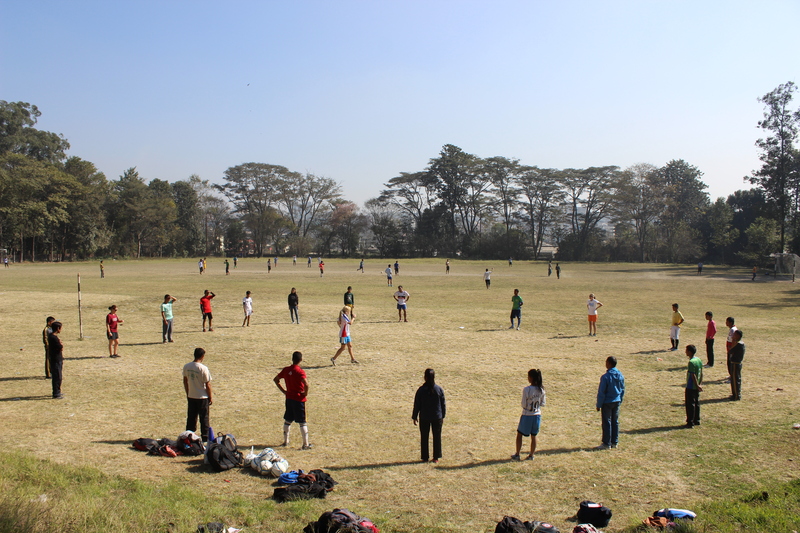 Schooling can be done on the football pitch. This week with Childreach solidified this notion for me, as I was able to witness and discuss it with a group that is equally as passionate about it as we are at CAC. Being part of a training like this one, being part of discussions like we have had with Childreach staff, being part of a group that shares my unadulterated passion for the union of education and football, being part of Coaches Across Continents, makes me more proud than words in a blog post can convey. I am lucky. Oh and after our week on the field, the three of us trekked our way through the Langtang region of the Himalayas for six days… Am I lucky? Yeah. Next: CAC in Portuguese Creole! Norah I am totally impressed with your blog. Your feelings and attitude come through to me loud and clear. I have not been to Nepal or India but have been with coaches across continents to other places and seen what marvellous results have been achieved. Keep up the good work and say hi to Sarah Brown.